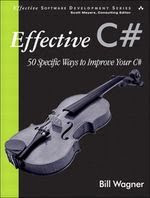 Just finished reading “Effective C#: 50 Specific Ways to Improve Your C#” book by Bill Wagner. It is very outdated, but anyway describes best practices of .NET programming. The book was written for .NET 1.1. and contains useful information about this platform. Nothing new for me just set of rules that each developer must know and follow. The book is well-structured and informative with big number of examples. There are some formatting and misprinting problems though. There is more up-to date version of the book, written for .NET 2.0. I’d better recommend reading newer one.